Stevens County’s small-town politics have taken many ugly turns this election season. A divisive race to replace the retiring sheriff has dredged up one candidate’s bankruptcy filings and internal investigations into the other candidate’s performance as a deputy. The former has been criticized as a member of the current sheriff’s “old boys’ club,” and the latter has drawn scrutiny for comments supporting the “Redoubt” movement. The elected prosecutor, meanwhile, has accused the county commissioners of misspending more than $30,000 from a fund dedicated to fighting homelessness. State officials are now investigating the expenditures, which went to a couple whose house near the Canadian border was damaged by flooding last spring. Commissioners asserted that the prosecutor’s complaint was aimed at protecting the county auditor in his re-election bid. The prosecutor, who’s running unopposed for his fourth term, has also been at odds with a District Court judge who faces an election challenge from the prosecutor’s chief criminal deputy. The prosecutor has accused the judge of bending rules in the courtroom. And earlier this year, supporters of the judge marched around the courthouse in Colville to protest how the prosecutor handled cases involving military veterans. Add to that a recent feud over death investigations between the sheriff and the county coroner, who’s also up for re-election, and voters are left with a complicated slate of options on the November ballot that could ultimately stoke or alleviate tensions among the various county departments. 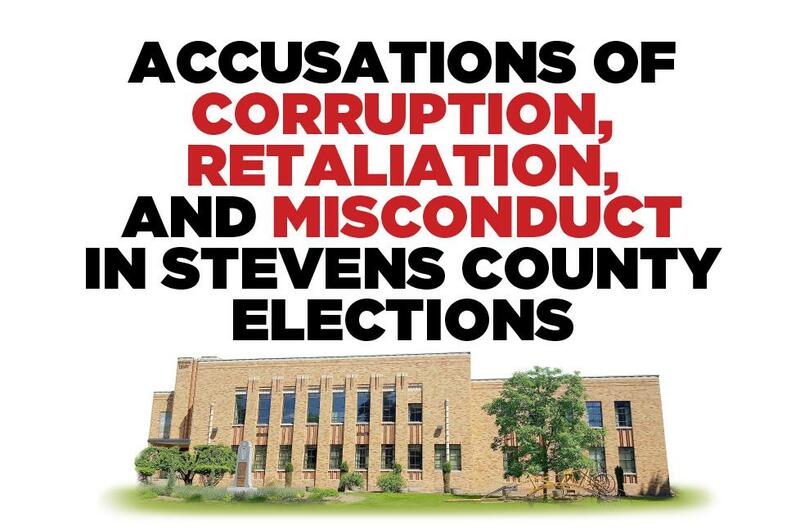 Some of the allegations have been thoroughly reported, while others have surfaced in Facebook posts and letters submitted to Stevens County’s weekly newspapers. Voters have been tasked with parsing whether the claims amount to senseless mudslinging or serious questions about government dysfunction and candidates’ fitness for office. After four decades in Stevens County law enforcement, Sheriff Kendle Allen announced in May that he would retire, abandoning plans to campaign for a third term. On the same day, Chief Patrol Deputy Brad Manke, a 21-year veteran of the sheriff’s office, announced he would run for sheriff with Allen’s “full support and endorsement.” On Facebook, Manke immediately unveiled a digital version of his blue and white campaign sign. “I look forward to your support and (to) continuing to serve the citizens I’ve sworn to protect,” he wrote. To some, it appeared that Allen, 61, had chosen to retire only when a hand-picked member of his administration agreed to run in his stead. Accusations began to percolate that Manke belonged to a sort of “old boys’ club” in the upper ranks of the sheriff’s office. But the nepotism accusations have been compounded by suspicions that Manke’s opponent, Mike Berry, was pressured to resign from the sheriff’s office for political reasons. After 20 years with the Albuquerque Police Department, Berry retired and moved with his family to Loon Lake in 2013. The following year, he says on his campaign website, he “renewed his commitment to community” by joining the sheriff’s office as a deputy. Before he resigned from that position in July, Berry had been the subject of several internal investigations. The first stemmed from a 911 call on April 24, 2017, records show. Berry was miles away in the Loon Lake area when he was assigned the call. Although Sheriff Allen had directed deputies to respond to calls in person whenever possible, Berry did not visit the alleged puppy mill, which had been the subject of many similar complaints before. Instead, he called Loss and told her that deputies were aware of the situation, that the operation met state standards for “minimum animal care” and that there was not much he could do. After speaking with Berry, Loss talked to other neighbors and brought their concerns to the county commissioners. More calls were made. Soon, deputies did respond to the property, where dogs had been living in filthy enclosures with festering wounds and too-small collars embedded in their necks. Deputies persuaded the owners, Thomas and Theresa Hostetler, to voluntarily give up nearly 40 Labrador retrievers, as well as a cat. More than a week after Berry spoke with Loss, he learned from his wife, who works with an animal rescue group called Rescue4All, that deputies and volunteers were taking the dogs to a temporary shelter at the fairgrounds in Clayton, Washington. Berry was placed under investigation while deputies established probable cause to arrest the Hostetlers, who would later plead guilty to charges of second-degree animal cruelty. Thomas Hostetler also pleaded guilty to one count of obstructing law enforcement because he had reached for a gun holstered at his waist when deputies arrived at the residence. The situation gained so much attention in Stevens County that Rescue4All made a Facebook event invitation page for the couple’s sentencing in October 2017. Berry said the internal investigation started right around the time he began openly mulling a run for sheriff. “This just was a golden opportunity for them to do the first of many attacks on someone who was thinking about running against them,” he said. After several interviews and an exhaustive review of call logs, Sgt. Loren Erdman – who is now Manke’s prospective pick for undersheriff – prepared a 21-page report suggesting Berry had acted negligently and incompetently. Among other things, the report found Berry could not have known enough about the Hostetlers’ property when he told Loss it was in accordance with state law. In a phone call and subsequent email to The Spokesman-Review, Loss said she had read the investigation report and found it “misleading,” though she did not point to specific inaccuracies. In another matter beginning in July 2017, Stevens County Prosecutor Tim Rasmussen and his chief deputy handling criminal cases, Lech Radzimski, complained that Berry had recommended charges against another alleged puppy mill operator without acting to remove the animals from her custody. And in yet another matter, Berry, who also serves in the Air Force Reserve, was faulted for refusing to provide the sheriff’s office with a training certificate he had received while on military leave. In September 2017, Allen slapped Berry with a 40-hour suspension, records show. But after Berry and his union pushed back on the disciplinary action, it was downgraded to a written reprimand in January, and the sheriff ordered that Berry be reimbursed for lost work days. Both Allen and Manke dismissed the notion that the investigations were politically motivated. In a statement in October, Manke also accused Berry of resigning “purely for political purposes” and leaving the department “dangerously shorthanded” in the wake of several other deputies’ departures. Berry has also been criticized for a speech he gave in February in Colville to secessionists who want to turn Eastern Washington into a 51st state called Liberty, a movement championed by state Rep. Matt Shea of Spokane County. After receiving questions about that speech, Berry sought to distance himself from the Liberty state movement, though he did not dismiss it outright, saying he sympathizes with the frustrations of Eastern Washington conservatives. In another statement, Berry refuted claims that he attends the Marble Community Fellowship in northern Stevens County. The leader of the fellowship, Barry Byrd, wrote a 1988 manifesto referring to Jews as “antichrists” and condemning interracial marriage. But Berry did acknowledge that members of the church had contributed to his campaign. Some of Berry’s internal investigation records were sent to The Spokesman-Review by supporters of Manke. But Berry supporters have followed Manke’s paper trail, too. In early July, representatives for the deputies union filed a formal grievance after Manke and his wife, Kate Manke, who holds the title of “chief civil deputy” in the sheriff’s office, transported a female inmate from King County back to Stevens County. Because neither of the Mankes belongs to the deputies union, the union complained that they had overstepped their duties, potentially depriving deputies of an opportunity for overtime pay. One Stevens County law enforcement officer, speaking on condition of anonymity, pointed out that Kate Manke lacks formal police training, and female deputies are required to take part in transporting female prisoners. Later that month, in an email to Sheriff Allen, union representative Taj Wilkerson reported “what can only be described as another attempt (to) coerce, threaten or intimidate members of the bargaining unit by Chief Deputy Brad Manke.” Wilkerson did not describe that incident in his email, but sources familiar with the matter, which has not been formally resolved, said both Brad and Kate Manke had made derogatory comments about the initial union grievance. Allen, meanwhile, said administrators in his office routinely transport prisoners and the union complaint is unfounded. The filings show that Manke and his wife filed for Chapter 7 bankruptcy after incurring $45,550 in unsecured debt. At the time, they had a 12-year-old son, a 5-year-old daughter, two dogs and four cats, and their home in Colville was valued at $125,000. They owned a 2004 Buick Rendezvous, a 1989 Chevy pickup, two four-wheelers, three motorcycles, a 27-foot travel trailer and 14-foot boat. In a Facebook post in September, Manke explained that his wife, who has multiple sclerosis, had begun “suffering severe migraines, numbness and tingling in her hands and face,” causing her to miss months of work over the course of several years and leading them to struggle to pay their bills. Though Manke said the attorney, Dennis Wallace, had erred by filing under Chapter 7 – which eliminates the need to repay most unsecured debts – the couple did not submit a bar complaint or refile for bankruptcy under a different chapter. In an interview, Manke said Wallace had been fully informed of the couple’s assets when the attorney filed their bankruptcy petition. Attempts to corroborate that were unsuccessful; Wallace died in 2007 at age 59. Other allegations that have surfaced because of the sheriff contest appear to have little to do with either candidate. In August, following up on a tip from Berry supporter Fred Brown, The Spokesman-Review reported on a 2016 incident involving Stevens County Undersheriff Andy Harbolt that is now under investigation by the Pend Oreille County Sheriff’s Office. In the two-way August primary, Manke led Berry with 50.56 percent of the vote. Joseph and Alena Boharski, who live on Sand Creek Road north of Kettle Falls, were among many property owners in the region impacted by historic flooding last spring. When the Kettle River overflowed with rain and snowmelt, gushing water swept away their front porch, and the eroding shoreline threatened to crumble their foundation, according to Stevens County records. In May, a county building official deemed the Boharski home unsafe to occupy. The riverbank would have to be reinforced, he said, or the house would have to be moved farther from the river. The Boharskis chose the latter option and hired a contractor, with their own money, to build a new foundation elsewhere on the property. In June, James Caruso, the director of the county’s emergency management department, wrote that the estimated cost of the Boharski project was $30,128. The county commissioners – Wes McCart, Steve Parker and Don Dashiell – followed suit, voting unanimously to reimburse the Boharskis that amount. The commissioners sent an invoice to the county auditor’s office, and the money was paid to the Boharksis in August. The commissioners also approved a $198.25 payment to the county’s land services department to cover the Boharskis’ site analysis and permitting fee, records show. In the weeks that followed, the prosecutor, Rasmussen, sent letters to the commissioners, the state auditor’s office and the Washington State Patrol, saying the commissioners had illegally withdrawn money from the homelessness fund, which consists of surcharges that people pay when they record documents such as property deeds. State law requires counties to collect those fees and maintain homelessness funds to pay for services such as shelters and low-income housing programs. In Stevens County, some of that money flows through a nonprofit social services agency called Rural Resources Community Action, while some goes to NEW Family Life Services, a faith-based, anti-abortion organization that runs a crisis pregnancy center and three-bed maternity home in Colville, where pregnant, homeless women can live for up to a year. Rasmussen has argued that the Boharski project didn’t meet the criteria for homelessness funding. In his letter to the commissioners, Rasmussen wrote that they are each personally liable for returning the money to county coffers – with interest. Attempts to reach the Boharskis by phone were unsuccessful. They bought their house, on a 1.3-acre lot, in 2011 for $140,000, according to property records on the Stevens County assessor’s website. Commissioner Parker, who represents the northern portion of the county, where the Boharskis live, declined to comment on specifics of the payment. But he, like the other commissioners, denied having known the Boharskis before their home was damaged. In interviews, Commissioners McCart and Dashiell defended the payment, saying it matched the goals of a 10-year housing strategy that the county adopted in 2012. Dashiell noted that plan addresses not only homeless people but also “people at risk of becoming homeless.” He acknowledged that the commissioners did not consult with an attorney before approving the payment to the Boharskis. “If we had to call a lawyer every time we wanted to spend money, we’d have lawyers sitting on our lap,” said Dashiell, who faces an election challenge from Jeffery Charvet. Charvet, who has a background in firefighting and emergency management, said about 25 other families affected by the spring flooding received about $600 each from the county’s “flood fund,” and that’s where the Boharskis’ money should have come from as well. “It’s very clear that money should never, ever, ever have come out of that fund,” Charvet said of the homelessness payment. McCart asserted that Rasmussen, who has endorsed Gray in his re-election bid, complained about the payment because the three Republican commissioners support Gray’s opponent, Lori Larsen, who until recently served as chairwoman of the Stevens County GOP. In an interview, Rasmussen, a Republican, countered that he simply believes Gray, a Democrat, is more qualified for the job of auditor. “Mr. McCart is mistaken as to my motivations,” Rasmussen said. McCart and Dashiell asserted that Gray had made a mistake by cutting a check to the Boharskis, rather than the company the couple hired to move their house. Gray disputed that, saying he had followed the commissioners’ instructions. The commissioners and Larsen also questioned why Gray did not raise concern about the payment until after his office gave it a stamp of approval. Larsen cited a section of state law that makes it a gross misdemeanor for public officials to fraudulently audit or dispense taxpayer money. Rasmussen said the WSP had declined to investigate the matter, leaving the task to the state auditor’s office. If investigators find that funds were misappropriated, Rasmussen said, he would likely file charges against the commissioners and then hand over the case to the prosecutor’s office in a neighboring county, which is commonly done to avoid conflicts of interest. Judge Gina Tveit, who has presided over Stevens County District Court since 2009, faces an election challenge this year from Lech Radzimski, the county’s chief deputy prosecutor handling criminal cases. But the most bruising criticism of Tveit has not come from her opponent. It has come from Radzimski’s boss: elected prosecutor Rasmussen. The result is an unusual politicization of the local judicial system that has had an obvious impact on several cases and defendants. In 2014, for example, Rasmussen requested a review of five misdemeanor guilty verdicts his office had won in Tveit’s courtroom, citing concerns that the defendants’ constitutional rights had been violated because the court had stopped providing juror questionnaires to attorneys on both sides. Two defendants declined to have their cases reviewed, but Spokane County District Court Judge Aimee Maurer looked at the other three and ultimately tossed out each conviction. More recently, Tveit and Rasmussen have been involved in a federal lawsuit claiming Tveit retaliated against a woman, Rachel Benjamin, who had been sexually harassed by another county employee while doing court-ordered community service. In 2015, after Benjamin pleaded guilty to driving under the influence, Tveit sentenced her to 75 days on the county’s “work crew.” After learning of the alleged harassment by work-crew supervisor Pat Walsh – who no longer works for the county – Rasmussen sought to dismiss the 36 remaining days on Benjamin’s sentence. Rasmussen, who faces sexual discrimination allegations of his own, has said he thought it was “the right thing to do” to get Benjamin out of the situation where she was harassed. Superior Court Judge Jessica Reeves granted Rasmussen’s request. But Tveit responded with an order of her own, reinstating Benjamin’s original sentence and accusing Rasmussen and Reeves of violating ethical rules. Tveit noted that Reeves had worked on the DUI case when she was a prosecutor and therefore could not rule on the case as a judge. One of Benjamin’s attorneys, Casey Arbenz, called Tveit’s actions “bizarre” and said it was cruel to reinstate Benjamin’s sentence. Benjamin’s civil lawsuit also accuses the District Court administrator, Nadine Borders, of attempting to cover up the harassment, which Borders has denied. The suit also claimed Tveit acted outside her authority as a judge by convening a meeting with two Stevens County commissioners and the county’s public works director to discuss the harassment investigation. But this month, U.S. District Court Judge Rosanna Malouf Peterson dismissed the claims against Tveit, who had claimed judicial immunity. Moberg, a former Grant County Superior Court judge, is being paid with public funds to represent Stevens County District Court, which includes Tveit as well as Borders. He said he plans to argue that Borders, as the court administrator, is entitled to “qualified immunity” in the Benjamin case. Moberg also represented Tveit in a previous dispute between Stevens County’s District and Superior courts over first-appearance hearings, which was decided in Tveit’s favor and is now before a state appeals court. She also points out that Radzimski’s wife, Christina Radzimska, and brother-in-law, Nick Force, both work in the prosecutor’s office. And she accuses Rasmussen of refusing to take part in her rehabilitative Veterans Court, a claim that motivated dozens of veterans to march around the courthouse in Colville in May, some carrying signs accusing Rasmussen of corruption. Her opponent, Radzimski, currently handles felony cases in Superior Court and declined to talk about the tenuous relationship between the District Court and the prosecutor’s office. “That would probably be a better question for my boss, Mr. Rasmussen,” Radzimski said. He said he wants to focus on other issues, such as the creation of a therapeutic court for people facing low-level drug charges. “The statistics and the evidence is there to back up these therapeutic courts,” he said. “They reduce recidivism, and that ultimately helps reduce your jail population and reduce your crime rate, if you can get these people turned around and get them back being productive members of our communities. “I think I’ve got the depth of knowledge to be able to do it,” he said. For now, some must continue to grapple with the fallout of the Benjamin case. Arbenz, her attorney, said the case seems emblematic of broader problems in Stevens County’s judicial system. Editor’s note: This story was changed on Thursday, Oct. 25, 2018, to correct the status of a legal dispute between Stevens County’s District and Superior courts. It was also updated to include a comment from Sheriff Kendle Allen regarding a union complaint over a prisoner transport. It was changed on Tuesday, Oct. 30, 2018, to correct the length of Mike Berry’s original suspension from the sheriff’s office.